Recently, James Wathen, a 73-year-old Kentucky man, lay in his hospital bed at death’s door. He had stopped eating and given up. But when nurses reunited him with his one-eyed Chihuahua, Bubba, Wathen rebounded, according to a report on Today. This heartwarming story is an example of the undeniable power of the bond between people and their dogs. But the benefits of having animals in your life isn’t only limited to owning dogs. A new survey by the Human Animal Bond Research Initiative found that 97 percent of 1,000 family doctors and practitioners surveyed said that they believed there were health benefits in owning pets in general. 75 percent of physicians said they saw one or more of their patients’ overall health improve, and 87 percent said their patients’ mood or outlook improved. What’s more, taking responsibility for another creature can prove beneficial. For example, Gail Melson, Ph.D., professor emerita of developmental studies at Purdue University, suggests that nurturing a pet (walking a dog or feeding a cat or fish) can be an important lesson in caregiving for children, especially young boys who might otherwise consider caregiving “girl stuff.” But it isn’t just good for children. Says Beck, “We never outgrow our nurturing behaviors. Pets allow us to be caregivers again.” And feeling needed or capable builds confidence. One of the more important non-dog-related animal-assisted therapy options, according to Beck, is therapeutic horseback riding. We’re not all lucky enough to have our own horses as pets, but — for those who do or even those who have the chance to ride regularly — benefits vary, from increased confidence to improved range of motion. 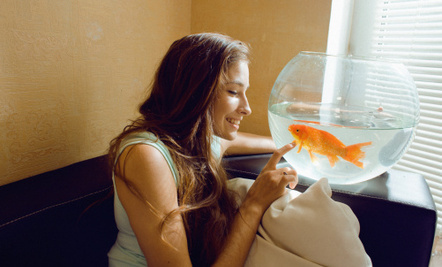 It’s not easy to hug fish, but it’s worth spending time with them: Even a goldfish in a simple tank can help relieve stress. For example, in a study by Beck, when phobic dental patients were exposed to fish tanks before treatment, they experienced benefits, he explains, as did psychiatric patients who were exposed to caged finches in another study. Later studies also showed benefits for Alzheimer’s patients, from increased relaxation to improved appetite. These findings have inspired many nursing homes to install aquariums or, in some cases, aviaries. The reason, according to Beck: Watching nature unfold is more riveting than watching, say, a lava lamp, for aging patients whose minds might otherwise wander. Just make sure you ADOPT, DO NOT BUY PETS PLEASE. Pets add years to your life...to the degree we are good to them. I think all animals help...even pet lizards and snakes..
To me this isn't at all a surprise. I have always had pets and love being in nature, as well as having many bird feeders. Many years ago my uncle in Europe had a small dog he adored. His wife had died, and later his daughter had moved to France and also died, hit by a car. The dog kept him going since he had put on a lot of weight and the dog was the only thing that kept him active since he was very energetic and loved being taken for walks. When the little dog died, my uncle very quickly withdrew, put on more weight and shortly after died. Without that little dog I think that would have happenned much sooner :( Pets, and even wild animals we can interact with, do indeed make a big difference.